Vespas are known for their distinctive shape and their pressed-steel bodies. 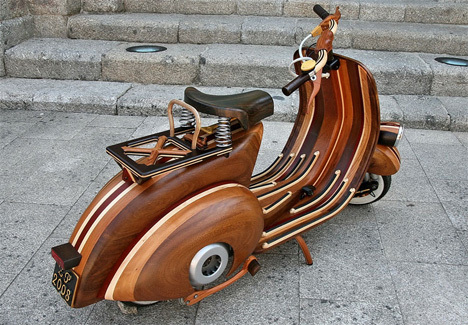 But one Vespa enthusiast decided to take those signature curves and recreate them in his material of choice: wood. 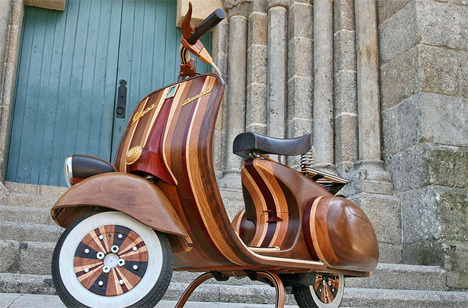 Portuguese carpenter Carlos Alberto built this amazing wooden Vespa himself and called it Daniela after his daughter. The love and devotion that were poured into this project are obvious. 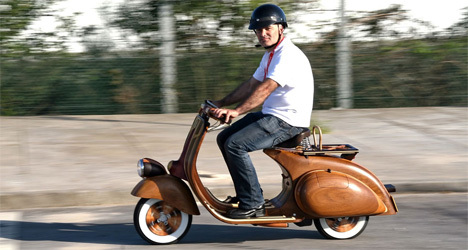 The body design was based on an original Vespa; the new body is made of laminated hardwood with a steam-bent wooden spine. Given the difference in materials, it’s hard to imagine that the redesigned Vespa would perform even at the laughably low performance level of the original, but it gets a pass based on its looks alone. The gorgeous new body is unlike any other scooter in the world, and Alberto is a true craftsman for bringing this beauty to life.